In large saucepan, heat rice and 2 2/3 cups water to boiling; reduce heat to low. Cover; simmer 15 to 20 minutes or until rice is tender. In small skillet, heat oil over medium-high heat. Add spinach and garlic; cook about 5 minutes, stirring frequently, until garlic is tender and spinach is wilted. Meanwhile, in large skillet, heat 2 to 3 inches water to boiling; reduce heat so water is simmering. Break cold eggs, one at a time, into custard cup or small glass bowl. Holding cup close to water’s surface, carefully slide egg into water. Cook uncovered 3 to 5 minutes or until whites and yolks are firm, not runny. Remove eggs with slotted spoon. Fluff cooked rice with fork. Divide rice evenly among 4 individual serving bowls. Top each with carrots, bell pepper, sautéed spinach and 1 poached egg. Drizzle with Sriracha sauce. Stir vigorously to combine. Serve immediately. This dish is best served with jasmine rice. 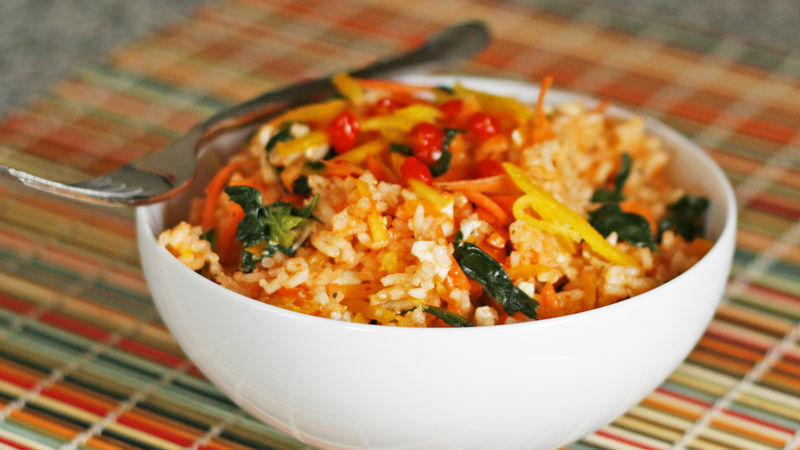 But you can use regular white or brown rice, or instant rice in a pinch. A rice cooker works great for easy, perfect rice making. Also try adding julienned cucumber, chopped green onions or canned bean sprouts to each bowl. The more veggies, the better!